And just like that, rugby league is talking about expansion. Or relocation. Or both, or something. And journos ‘On The Pulse’ (and in encrypted WhatsApp chats) are explaining the arcane and business-like practices that the ARL Commission has mooted to shift Sydney clubs out of town, to ensure viability and profitability and to uphold the greater good. Nothing locked in, of course, for these are but fishing exercises by suits in high places. Politicians do the same thing with policy; leak a backbencher’s brain-fart to the papers, see how it flies among the populace. Cheaper and easier than focus groups. Even more transparent, in a back-arsed sort of way. Policy played out in the court of public opinion; it’s how we roll in these late twenty-teens. Anyway – the ARLC and/or the NRL (never really get the demarcation, who’s boss of what) have cobbled together a plan, a white paper, even, to prop up under-performing Sydney NRL clubs with revenue that would apparently flow from broadcasters once that club had relocated to a new place where people watch telly. And one supposes that makes sense in a Ken-Cowley-taking-Super-League-to-the-massive-untapped-markets-of-New-York-Johannesburg-and-Hong-Kong kind of way. Ridiculous. Madness. Relocation disenchants and disenfranchises existing fans, while new ones get a sort of half-arsed relocated mob from somewhere else. That they can’t really own. It’s like when politicians are parachuted into safe seats. Who are these people? It’s like a bad merge. Everyone’s sold a pup, a homeless hound that nobody owns. Yet it seems they’re looking to do it, these political players, because television money tells them it’s time. 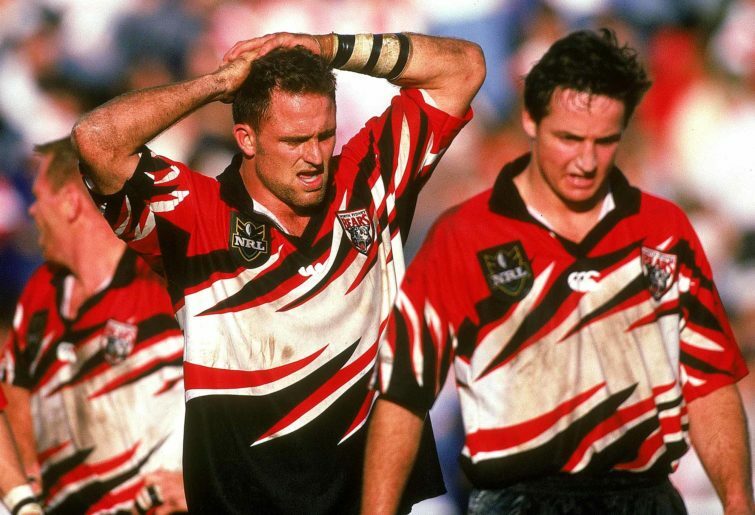 Yep: the North Sydney Bears. Yes, yes – adding a team in Sydney would appear to fly in the face of the “there’s too many teams in Sydney” argument. I can see how that might appear. But they should still do it. And they should do it because there is not a team in northern Sydney. And there are lots and lots and lots of eyeballs. There are 600,000 people in northern Sydney, which is more than the Sydney catchments serving Roosters, Rabbitohs, Dragons, Sharks, Sea Eagles and Bulldogs. From Kirribilli to Hornsby Heights, from the Roseville Bridge to north-west Ryde, 600,000 people don’t have a footy team to call their own. And there used to be one called the North Sydney Bears. 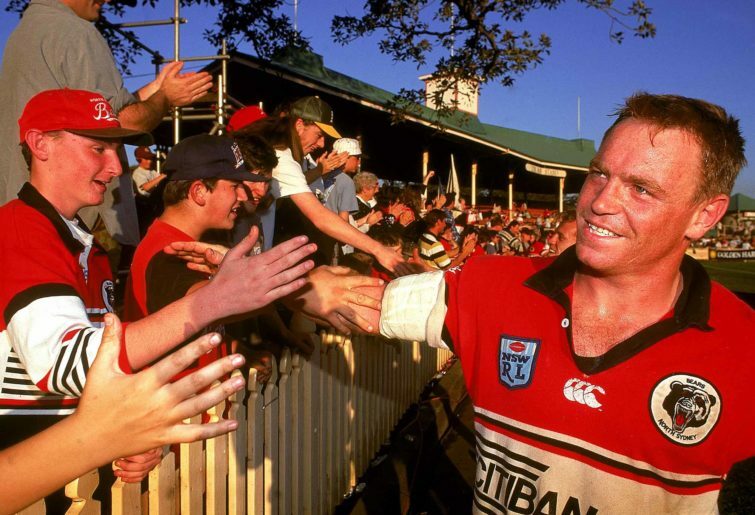 And if you brought back the North Sydney Bears to represent these 600,000 people in the northern suburbs of Sydney, it would be an instant and irrevocable success. “Fish where the fish are,” is something my old man would say, and he didn’t even like fishing. The television folks would say the same. I had a yarn once with an academic, Hunter Fujak, of University Technology Sydney. He’s a doctor of demographics. He’s done the PhD, bought the T-shirt. He’s in demand by NRL clubs. He’s presented Powerpoint shows to many suits detailing the findings of his years of study into Sydney people’s sports-consuming habits. And Dr Fujak’s research tells us this: Canterbury has 440,000 people in their catchment. Cronulla has 220,000, the Dragons have 260,000 (not counting Wollongong). Manly has 250,000, the Roosters 200,000 and Souths 390,000. Only Parramatta (890,000) and Wests Tigers (690,000) have a larger catchment while Penrith (590,000) is about the same. And all those catchments have a team, while a 600,000-strong chunk of Sydney does not. Thus a merge of Sydney Dragon-Sharks would be “logical”. As would Electric Dog-Eels. But like the Northern Eagles, they would be abominations. Nobody would win, not even TV. Because of emotion, tribalism, and all that good, “human” stuff, the Northern Eagles were horrible. The north shore isn’t the northern beaches. People conflate these regions but they should not, for they are like two Koreas. They are not like two Koreas. But they are separate, distinct entities. And the Northern Eagles ultimately didn’t represent anyone from Milson’s Point to North Turramurra, from west Willoughby to east Epping. They represented Manly. The northern beaches. And those worthies eventually killed and ate their Siamese twin, and took the license for themselves, for they are nothing if not their own people. Now, this is not a bad thing, per se. Tribalism is good. It’s why people follow footy teams. Why they invest in a footy team with themselves, with emotion, with money. And that’s why the 600,000 people from Kirribilli to Mt Colah who don’t have a rugby league team, would back the North Sydney Bears. They would invest in the Bears, consume the Bears, love the Bears. 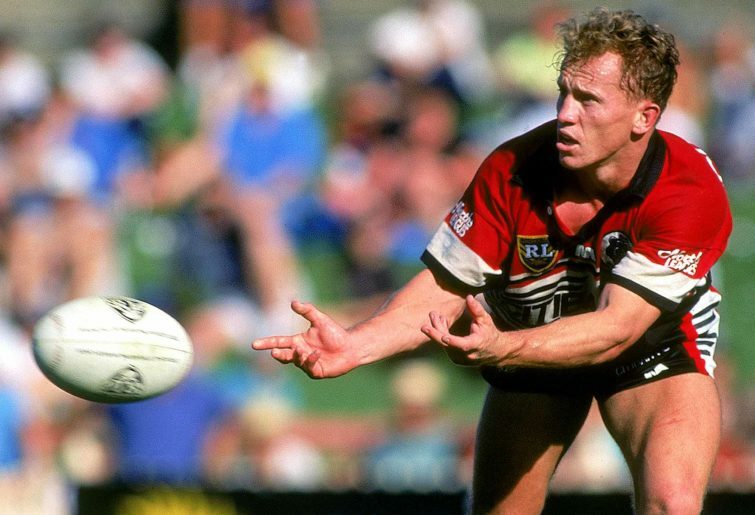 The North Sydney Bears would be back and there would be, give us your best Rabbits Warren, deadset jubilation. Maybe not jubilation. But they’d be into, the northern Sydney Bear people, all six hundred thousand of ‘em, or whatever percentage could plane off and declare allegiance, and consume the club and love it one way or many. Had another chat with a bloke involved in the Bears’ ill-fated bid for the Gold Coast license, and he said the NRL told them not to use the media to play things out when that’s what they should’ve done see above re: policy and popular opinion, another story. Anyway – old mate also said the next step wouldn’t be Bears to Perth but rather Port Moresby (!) because the Australian government would like to use rugby league to do something with regional aid or sufficiency, or something, I don’t know, I didn’t get much further into his explanation because I was gob-dangling speechless that old mate was actually talking about Papua New Guinea as a dinkum locale for a red-and-black comeback. For mine, sports fans, that is freakin’ La La Land. People follow footy teams largely because the team represents them, their patch, their people. It’s the same in Canberra as the Shire as Townsville, TNQ. And relocating an entity, be they Bears, Dragons, Sharks, Tigers, Roosters, whoever, well, knowing fans as I do – and being one of them – you’d just as soon as kill your team as watch it move away. After Norths were kicked out, mates of mine haven’t been to a league game since. When Souths were kicked out, mates of mine followed Randwick. There’s still people holding a candle for the Newtown Jets, though not enough that they’re not destined to forever be a reserve grade feeder out of Henson Park. But the Bears are a different beast. So bring ‘em back, baby, and fill Percy’s Bar. Watch the people stream across Miller Street and into Bear Park, and fill it full to burst. They would dinkum hang from the trees. And it would be magnificent.